Cleve Nichols of US Fibers, accepts the Ambassador award on behalf of Edward S. Oh, with Gov. Haley. COLUMBIA, S.C. – March 20, 2013 – Edward S. Oh, president and CEO of US Fibers, was honored yesterday as an Ambassador for Economic Development by the Department of Commerce as part of South Carolina’s Industry Appreciation Week. The ceremony took place in Columbia on Tuesday, March 19 on the grounds of the Governor’s mansion and highlighted 47 individuals from 46 counties for their exceptional efforts to bolster community and economic development activities in South Carolina. Oh and his Pac Tell Group opened US Fibers in Edgefield County in 2004. Since that time they have expanded several times, most recently in 2012. Multiple states were courting US Fibers for these investments but both times Oh made the commitment to Edgefield County. 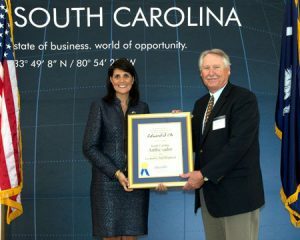 He and his leadership team are involved in various business associations promoting growth throughout South Carolina. In 2012, Oh was elected president of the Korean Trade Association for the Southeast. Since 2004, Oh has continued has expand his company’s presence in South Carolina four different times, each time doubling in capacity and employment.